Intel's newest generation of desktop and mobile CPUs, code-named Ivy Bridge, debut today. In our tests, the chips showed moderate overall performance gains and substantial graphics improvement, all while sipping significantly less power. Built in the company’s 22-nanometer, tri-gate manufacturing process, the new CPU contains 1.4 billion transistors in a scant 160mm2 die area. The CPU includes the redesigned Intel HD 4000 graphics processing unit, which delivers the best integrated graphics performance we've ever seen. In fact, in our tests, HD 4000 graphics blew away the performance of an entry-level discrete graphics card. Today, you'll find Ivy Bridge chips primarily in desktops and all-in-ones. The first Ivy Bridge chips on the market will be the higher-wattage models best suited to those systems and to powerful desktop replacement laptops (you'll see a few Ivy Bridge models in that segment, too). It will take another six weeks or so for the dual-core and lower-wattage models to hit the market, so the majority of thin-and-light and everyday affordable laptops won't update to the new chips until then. So how will you be able to tell whether you have an Ivy Bridge CPU in your new computer? Look for the "3rd Generation Core Processor" brand name. You can also tell from the model number: Systems with a 3000 number after "Core i5" or "Core i7" use Ivy Bridge, while systems with a 2000 model number are Sandy Bridge. So, a Core i5-2600K, for instance, is a current-generation Sandy Bridge processor, while a Core i5-3550 is a new Ivy Bridge model. Will you pay more for Ivy Bridge? Not really. Enthusiasts buying parts to build their own systems might pay a little more at first when supplies are scarce, but you shouldn't expect a significant difference in price between complete systems made with Ivy Bridge chips and the similarly configured systems of today using Sandy Bridge. Intel estimates that the Core i7-3770K should run most processor-intensive chores about 5 to 10 percent faster than the similarly clocked Core i7-2700K Sandy Bridge CPU and our tests generally bore that out. The PC World Labs ran WorldBench 7 on three platforms. Our baseline system is built around an Intel Core i7-2600K (not 2700K), which runs at 3.4GHz and has a maximum Turbo Boost clock of 3.8GHz. The baseline system also includes an Nvidia GeForce GTX 560 Ti discrete graphics card. You'll see three systems compared below. The Core i7-3770K is the new Ivy Bridge processor; it was tested both with the Intel HD 4000 integrated graphics and with a GeForce GTX 560 Ti graphics card. The Core i7 2600K is the current-generation Sandy Bridge processor, equipped with a GeForce GTX 560 Ti graphics card. This is our "baseline" WorldBench 7 system used to determine what a WorldBench score of 100 should be. When both systems were equipped with the discrete graphics card, the Ivy Bridge CPU scored 10 percent above the baseline--which is greater than a mere 3 percent clock-rate disparity would indicate. Also, the Ivy Bridge system running with only the Intel HD 4000 GPU still scored about 4 percent higher than the Core i7-2600K. 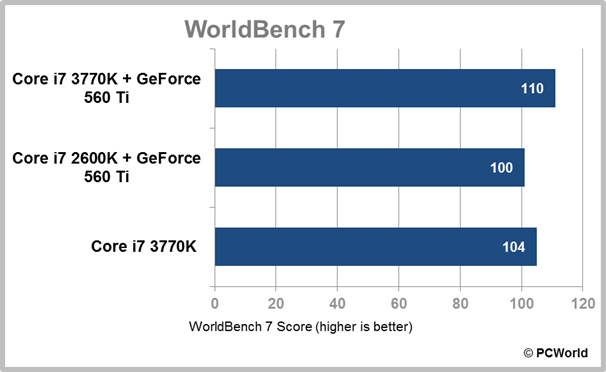 Bear in mind that WorldBench 7 does not incorporate 3D gaming-graphics tests. For more on the graphics advantage of Ivy Bridge, check out our feature on Ivy Bridge graphics. Overall, the Ivy Bridge CPU looks to perform slightly better than an equivalent Sandy Bridge CPU, while consuming less overall power. That’s a win on the desktop side, but the real gains will likely be on laptop systems, where the performance gain combined with a lower power draw may result in laptops that offer longer battery life while improving performance.